Each time an artifact in play is tapped or its activation cost is paid, Haunting Wind does 1 damage to that artifact's controller. Is not triggered by continuous artifacts. 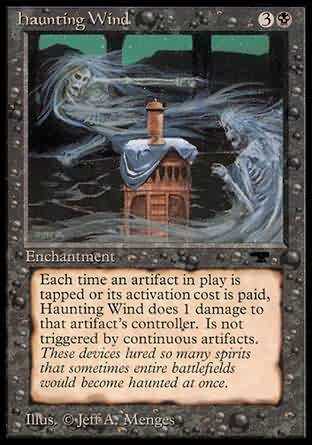 Whenever an artifact becomes tapped or a player plays an artifact's activated ability without T in its activation cost, Haunting Wind deals 1 damage to that artifact's controller.